Anaïs is the main character of “Anaïs s’en va-t-en guerre” (Anaïs is at war), a French documentary film by Marion Gervais. I like the story of this young woman who dreams of cultivating her own aromatic plants farm in Brittany. She does everything she can to make her dream come true and faces difficulties but she doesn’t give up. I keep in mind a scene of the film when Anaïs moves all her plants alone. 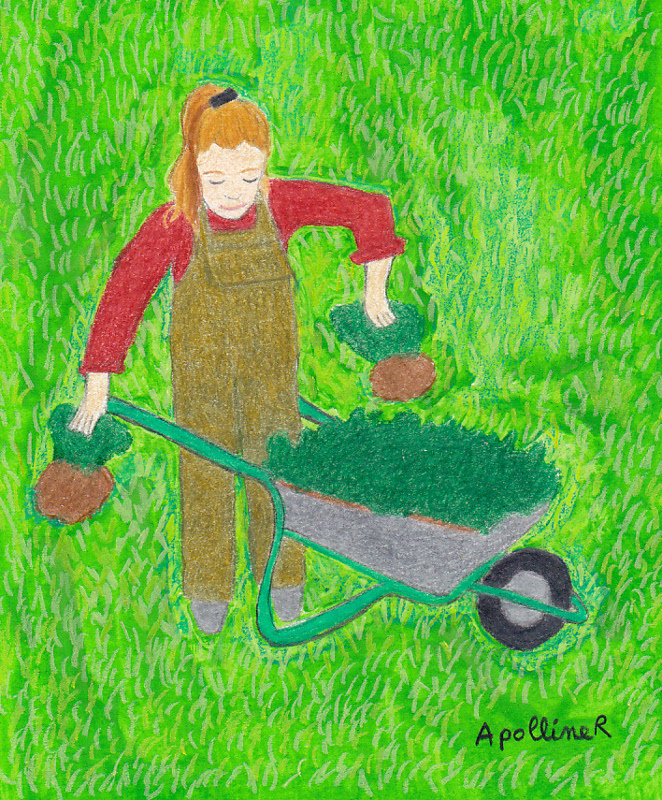 Imagine a frail young woman trying to push a big wheelbarrow full of soil and plants. The wheelbarrow is clearly too heavy for her. So Anaïs takes gently some plants and put them on the floor. She lightens the wheelbarrow until she is able to push it. Then she continues on her way as if nothing had happened. I think it’s a nice metaphor for the way she handles obstacles. You can watch an extract of “Anaïs s’en va-t-en guerre” (in French) on here. I have seen an interview with the director who said the film may be translated into English in the future. I hope so. This entry was posted in Inspiration and tagged drawing by ApollineR. Bookmark the permalink.